Getting into gambling affiliation can be incredibly lucrative and quite fun. But there are some challenges involved. One of them being choosing the host for your affiliate site. It’s the legal side of things that’s making things difficult, and you want to find a way to legitimately run a fast & secure site without worries about the host banning your account. It’s getting more difficult to find a stable host with enough speed to run your gambling niche website on. Many hosts don’t accept gambling related topic on their servers. As it stands, there are hosts (servers) that will shut down your site without notice if the site is based on gambling. Due to the legal complications from certain countries, these servers simply don’t want to get involved. And there’s not much you can do about it, because they usually have it within the fine print people typically don’t read or understand. Once they pick up on what you’re doing, it’s game over. Forums are rampant with affiliates breaking down and asking advice on what they should do, because Hostgator, Bluehost or Godaddy closed multiple of their sites overnight. The good news is you have alternative options when choosing gambling friendly hosting, and we’ll be exploring these in this article. 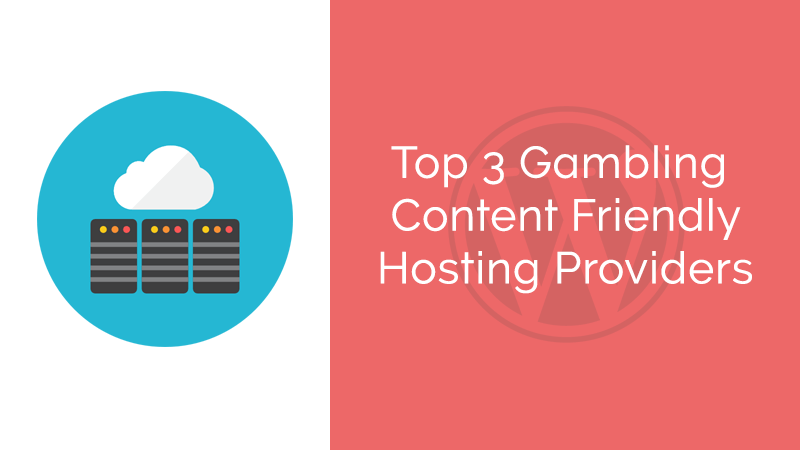 We’ll also look at some specific and popular hosts that you should be avoiding. Before getting into the recommendations and warnings, it’s important to know what you’re looking for. First and foremost: the host must accept gambling niche websites! Siteground is a host known for its incredible performance and support. I could always reach their chat support within 2 mins and the staff is extremely knowledgeable and reactive. Chat support doesn’t dismiss you with the usual BS canned messages like in the case of Godaddy and similar terrible host giants. Siteground have 5 data centers across the globe, multilingual teams and offer hosting services internationally. It’s an independent company as well, which is rapidly growing and has been around since 2004. Other great things about SiteGround are that it works seamlessly with WordPress, it provides free SSL via Let’s encrypt, and 1 click cloudflare CDN setup. But more importantly, it actually does what it says it can do. Their TTFB (Time To First Byte) metric is indeed impressive, and because of the data centers around the globe, you are able to give international visitors a fast experience on your gambling niche site. With Digital Ocean there are two main benefits that stand out. The first is the freedom you get by using a VPS. You can scale very easily, takes a couple of minutes to spin us a droplet and you can choose the amount of memory, storage space and the number of processor cores you want to use for running your site. They provide the best technology, and you can expect to find this general opinion all over the web. It should be noted that Digital Ocean does not offer managed VPS meaning: there is no cPanel or other “user friendly” control panels with this hosting package. So we recommend this for more experienced server users – a great foundation for your gambling affiliate site. Absolutely unmatched price / performance ratio for a Virtual Private Server. Honestly, Digital Ocean is dirt cheap with its packages, and delivers insane speed experience. DreamHost is a hosting services officially recommended by WordPress.org and as you can imagine, it’s probably the most user-friendly choice on the list. With an easy interface and control panel, it doesn’t take long to figure out why overall ratings for the hosting are near perfect. Uptime is excellent and your renewal bill will not break the bank. Going through their terms and conditions page you can see that they accepts not only gambling niche sites but they are even okay with customers hosting their adult niche websites (within the limits of legal boundaries of course) which shows their flexible approach to giving users the liberty to host a broad range of content topics on their severs which is a benefit by itself. The entry level packages are already very fast speed and the prices are great. For a little bit of an upgrade fee, it also offers Linux-based tier VPS packages that are bound to work with your ideas for the site. Hostgator has got a big list of unacceptable content topics and gambling is one of them. Like mentioned earlier, these guys don’t ask questions when they find you breaking the rules. Bluehost is another popular server that prohibits gambling outright. You could try and stay under the radar, but you’ll always be at risk of getting banned. We found it cheap but the shared hosting package is just unreliable – you get what you pay for. This is by far the most dangerous hosts of them all, and Godaddy pays close attention to the sites they are hosting. The moment they get suspicious it’s game over, literally. And if you didn’t have an off-site backup your site is gone – they won’t do second chances or be patient and give you a couple of days to move to another alternate host. Godaddy just pulls the plug if you broke the rules. While online gambling keeps on getting more popular, there are certain entities that work against it for natural reasons. But the negativity surrounding gambling increases the difficulty of finding a quality and stable host, because the list of servers blocking gambling niche sites is still growing. Just like PayPal tightened their grip around what their clients are receiving money for, servers followed the trend. But luckily there’s another list you can look at without the fear of waking up to a non-existent site. Because all three of the recommended gambling niche hosts are equipped and able to handle your sites. You should go with SiteGround if you want incredible speed, advanced WordPress features and probably some of the best support. If you want more options at advanced technical levels and you are a server command line guru, Digital Ocean is the natural choice, plus it’s very cheap. Dreamhost is the perfect choice for beginner affiliates, just starting to figure things out. We’re going to leave you with a last bit of advice, namely paying attention when you choose a host. Thoroughly go through their terms and conditions, and if you don’t find anything there, contact them. Don’t launch your site on a host you don’t know for sure allows gambling niche sites. If you have a favorite host, or additional experiences to share, be sure to leave comments on these posts too! 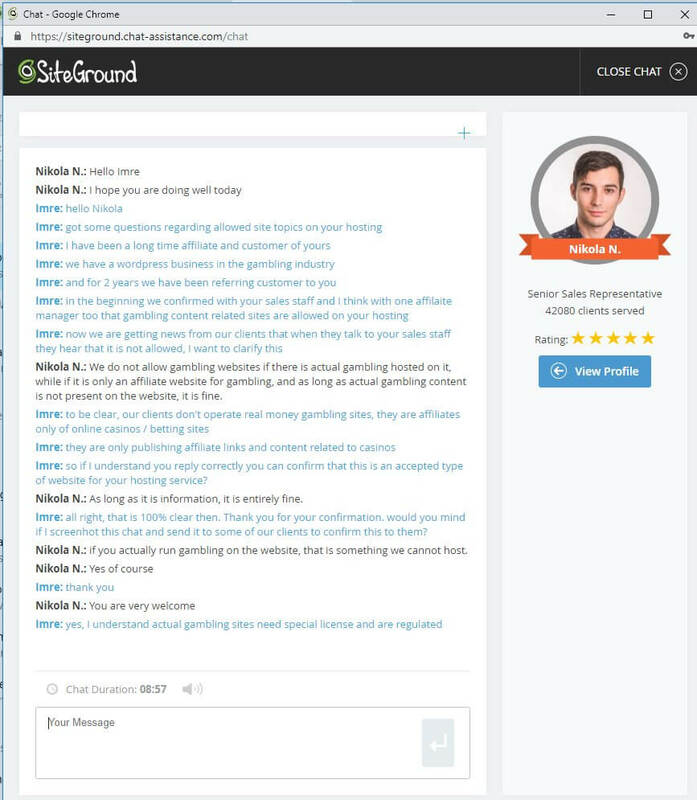 SiteGround does not allow betting/gambling sites. From their support: It will be fine to host the site here if its with betting tips and advise only. But if you mean a site that directly allows for betting through the site itself – we won’t be able to host such a site. Hi Dorde, yes that’s right – Real money gambling sites are not allowed BUT here at VegasHero.co we are primarily talking about hosting for gambling affiliate sites which consist of gambling related content and demo (free-to-play) slots / casino games at best – this is 100% ALLOWED and compliant with Siteground hosting.